‘Tis the season for overindulging with friends and family. Last weekend I had two work Christmas parties to attend and by Sunday I wasn’t feeling too fresh. Especially when the Saturday party was my old company which amongst the staff is renown for being a great night, where the alcohol is flowing, actually more a torrent of a river of booze. This year I had grand plans to arrange a hair of the dog roast to recover from the night before excesses. From past experience, it was very dubious that anyone would be in a fit state to even leave their house or beds to get out for a roast. But surprisingly we managed to assemble the next day slightly worse for wear and covered head to toe in glitter (the artwork guy had pockets of fairy dust in his pockets…I’m still finding it everywhere!) we headed to my favourite restaurant in Bristol, The Ox for a heavy dose of well needed hair of the dog. Sunday Roast and Bloody Mary are the best way to get over the excess amounts tequila from the night before. I started with a Red Snapper, Bloody Mary with Tanqueray Gin. Spicy and delicious, it could of push me over the edge of crawling back to my bed or make me a champion of the day and be able to face whatever is thrown at me. 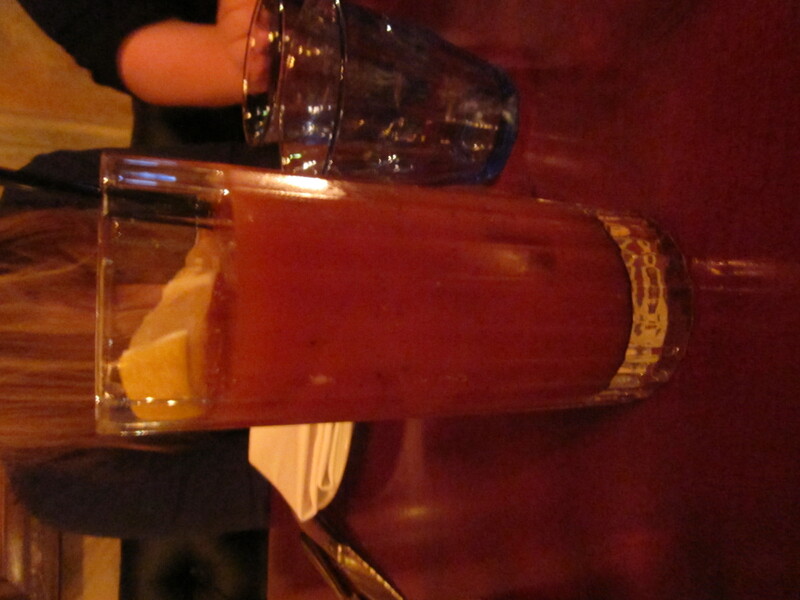 My friend was more ballsy and went for the Bloody Bull, Bloody Mary with beef bouillon and gherkin, I mean it was awesome with the beef, meaty notes but I was saving myself for the proper meat feast of the roast. 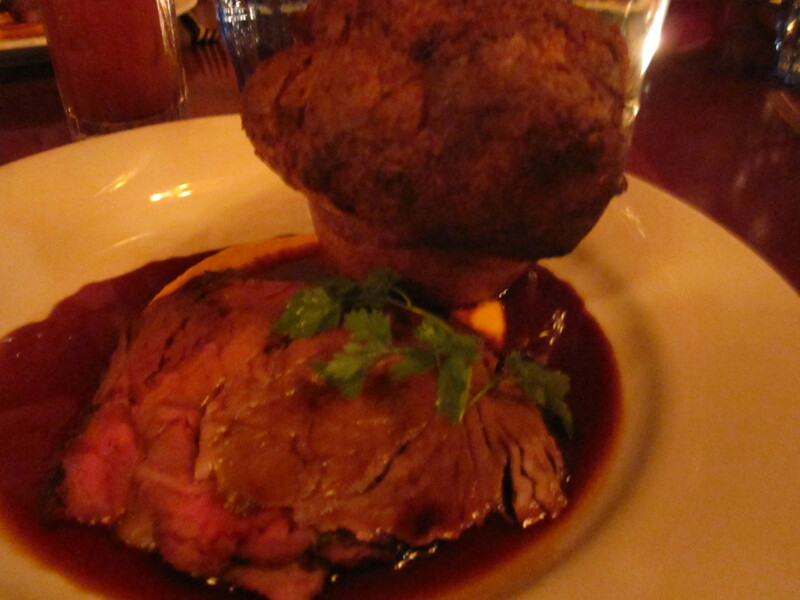 Drumroll, please….Roast beef rib-eye roast! Tender rare dreamy slices of perfectly cooked beef on a bed of carrot purée and the biggest Yorkshire pudding I’ve ever had. 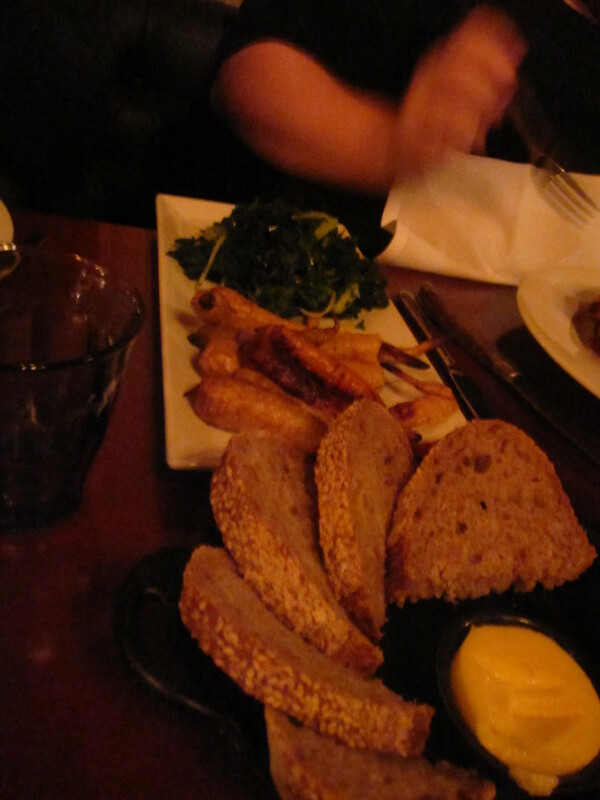 Due to the atmospheric lighting in The Ox, below isn’t the best picture to showcase how utterly awesome this roast is. Granted it’s not the cheapest in Bristol at £17 but when all the components are done perfectly that price doesn’t come into consideration as would happily pay that every Sunday to get to a plate of this divine roast. 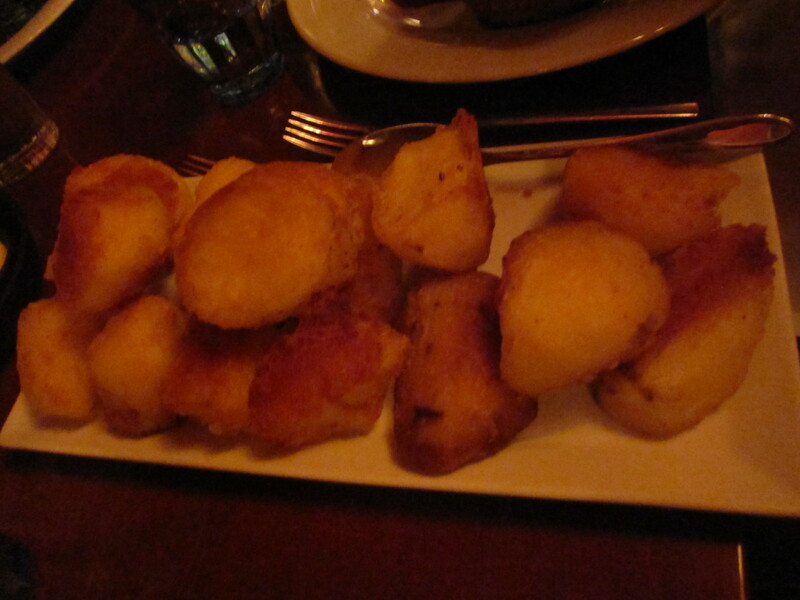 As well as the insane beef, a platter of the crispiest roast potatoes sent from heaven. A good healthy measure of these fluffy crunchy nuggets that vanished in front of our eyes far too quickly. Roasted parsnips and carrots, herby tender kale also ended up heaped to the sky on our plates to complement the whole dream team roast. Now you would have thought that after all of that meaty goodness, that there won’t be any more room for another morsel. You are so wrong if you think I would pass up on the amazing ice creams and sorbets on offer. Brown Bread Ice Cream and Green Apple Sorbet, hell yeah son. The ice cream had caramelised nuggets of the nutty bread, which had added a great texture to the creamy rich base. 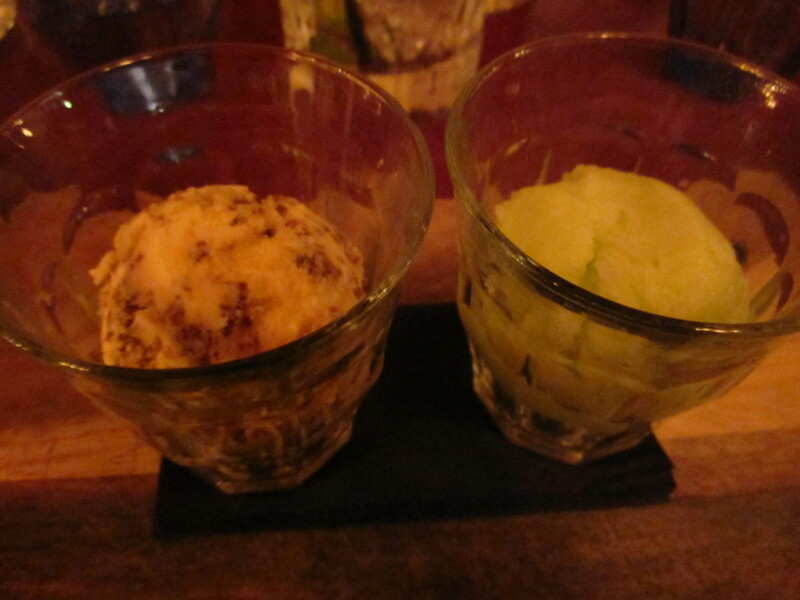 I’ve had the sorbet before and love the fresh vibrant flavour from the apple, a great ending to a restoring meal. Of course, you don’t need to be hungover to enjoy the delights of The Ox and actually recommend to go cold sober so you can take advantage of their brilliant cocktail list. So why wait and get on the meat! what a delicious dinner food, i also want to have it.